Agricultural crime can be devastating for farmers and with expensive machinery, vehicles, metals, irrigation systems and tools onsite many farmers can struggle to recover from a large break-in. Farms can be seen as easy pickings for burglars due to a general lack of security and slower police response times compared to urban areas. Fortunately, these crimes can be made preventable with the implementation of even the most basic security products. Thornhill Security offer a range of products to help protect your agricultural facility from theft. Outbuildings, barns and dairy parlour doors can easily be compromised if not secured properly or left unlocked. 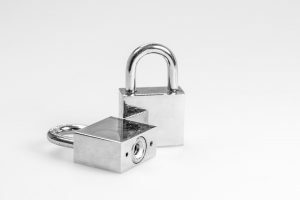 A security Padlock is a simple and effective deterrent to theft and unauthorised entry, they are also one of the cheapest security measures you can implement on an agricultural site. If you have a number of doorways that need to be secured, numerous padlocks can result in a large, impractical set of keys. Having a master key system eliminates large sets of keys and allows you to distribute keys and control numbers with pre-set levels of access; reducing the risk of any internal theft which unfortunately is commonplace in many industries. We have a number of master key systems available at Thornhill Security from both Mult-t-Lock and ABUS Security. Many businesses use steel cabinets to secure high-value items such as cash and sensitive documents, but they can also be used to store tools and equipment on farms. Security cabinets are available in a range of different sizes to suit your needs – our Chubb Forceguard security cabinet can be ordered in sizes up to 1900mm in height giving you ample room to store most tools. Also large reconditioned safes could also be considered. Guns are often present on farms, and it is absolutely essential they are kept secure. Not only can guns be a valuable target for burglars, but they can be dangerous when in the wrong hands. To ensure your firearms are safe – you should invest in a gun safe that complies with the latest British standards. 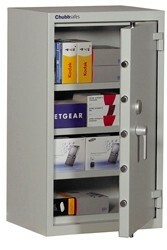 We have a range of gun safes available, with low-cost options and holding capacities of up to 10 firearms available. Hardened chains are the ideal solution for securing machinery and vehicles in and outside the barn, they are made of hardened steel so have a high resistance against cutting. They are available in a range of different sizes and come with an anti-corrosion coating meaning they can be used outdoor all year round without rusting. However, these hardened chains are only as strong as their point of anchorage. We recommend investing in a security anchor plate to bolt into the floor or wall and ensure the hardened chain can’t be compromised. Sometimes farmers will use shipping containers to keep their tools and machinery safe, however, these can easily be broken into with the right equipment. Investing in a heavy duty lock for a shipping container makes a break in much less likely. 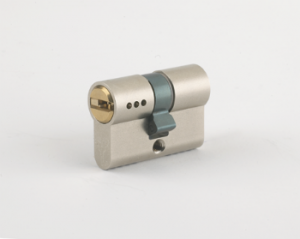 We would suggest the ABUS container lock with Granit Padlock. We can offer the ABUS Codeloxx electronic cylinder with a combination code or close proximity chip to avoid the use of keys, if required, and door entry can be granted online for the high tech user. Our team of security experts are always on hand to provide farmers with information and advice on how to properly protect their livestock, machinery, tools and other equipment. For any more information about the products and services we can provide to ensure your farm is secure, please don’t hesitate to call one of our expert team on 0117 967 4994.